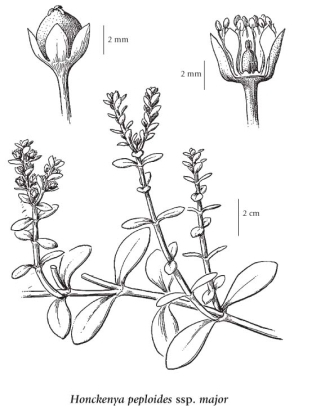 Succulent perennial herb from a deep taproot and slender rhizomes; forming mats to 80 cm across or more; stems numerous, trailing, usually freely branching, glabrous, flowering stems prostrate to erect, 5-40 cm tall/long. Basal leaves lacking; stem leaves opposite, 3-10 pairs or more, from lanceolate to egg-shaped, sharp-pointed to obtuse, 1-4 cm long, 3-20 mm wide, fleshy, yellowish-green, glabrous, often with sterile axillary shoots; stipules lacking. Inflorescence of solitary or a few flowers in the upper leaf axils, perfect or unisexual; petals 5, greenish-white, egg-shaped, 2-3 mm long; sepals 5, egg-shaped to lanceolate, 4-7 mm long, glabrous. Capsules globose or nearly so, 6-10 mm long, 3- to 5-valved; seeds chestnut brown, 3-4.5 mm long, smooth. Moist sandy beaches and grassy shorelines in the lowland zone; common along the coast; N to AK, YT and NT and S to NW OR.